• Recorded Event of the Year for "I'm Blue, I'm Lonesome" with Hank Williams, Jr.
• Instrumental Recorded Performance of the Year for "Blue Rock Slide"
"The Grascals are now six years old and we're still in the dance with the rest of the great bluegrass artists out there. We're very honored for all our IBMA nominations received today. Special thanks to all the fans, radio and IBMA members for their vote," says Jamie Johnson. "Thanks to the good Lord for letting us make the music that we love and continue to love - and will love for the rest of our career!" 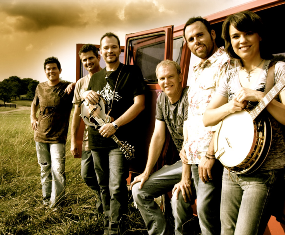 Known as a genre-bending sextet that strives to give their audiences 110 percent each time they take the stage, The Grascals borrowed The Monkees' pop hit, "Last Train to Clarksville," and "grassed it up"as the first radio single and video from their fourth album, THE FAMOUS LEFTY FLYNN'S, which currently sits at #1 on both the Bluegrass Unlimited and Bluegrass Music Profiles charts. They will continue to open dates this Fall for the Hank Williams, Jr Rowdy Friends Tour, along with Jamey Johnson, Eric Church, Colt Ford, Gretchen Wilson and Sunny Sweeney. The announcements were made this morning at the Country Music Hall of Fame & Museum; winners will be announced September 30 during the IBMA Awards Show at the Ryman Auditorium. Following three weeks of recording in Studio E, with engineer, Matt Coles, at Sound Kitchen Studios, the Kentucky Linemen just released their video, garnering some 16,000 views on You Tube. Mootown Entertainment and The Kentucky Linemen. They filmed a portion of their video for their lead off single, "Walk On", in the Big Boy Studio and at Lookout Mountain. It is definitely a must see video. The group's harmonies are extraordinary. Music Legend, Dolly Parton, recently worked in Studio D, performing a voice over for Palomar /Buffalo Gal Pictures. 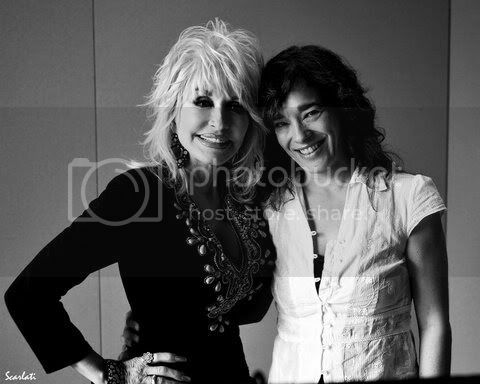 The session was recorded for an upcoming movie entitled "The Year Dolly Parton Was My Mom". The story goes like this.....it's 1976 and Elizabeth is just your average suburban 11-year-old praying for adolescence to arrive, when she discovers her whole life has been a lie. With only her imagination to guide her, Elizabeth runs away in search of her true identity. Her adoptive mother, Marion is then forced to break out of the carefully constructed "truth" she's been clinging to, and go after her daughter. This leads to a cathartic cross-country trek by a mother searching for a daughter who's searching for a mother - both of them really searching for themselves. 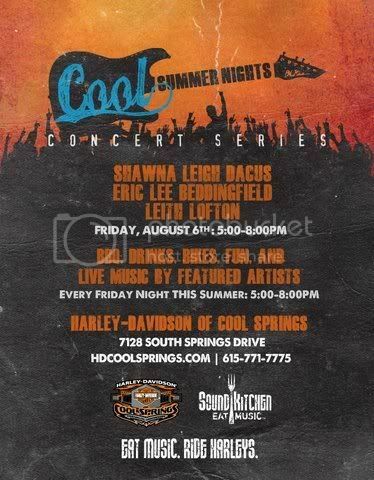 Sound Kitchen Studios and Cool Springs Harley Davidson invite you to attend their summer concert series on Friday, August 6th located at the Cool Springs Harley Davidson location on Cool Springs Blvd. Grab a drink and some food and listen to some great Nashville music! Tre Michaels, grandson of Country and Rock Legend,Conway Twitty,recently recorded a seven song EP in the Sound Kitchen's Big Boy studio. Songwriter of the Year and uber-producer, Rusty Golden, was at the helm, fusing country and rock genres, utilizing the talents of legendary "Rock" musicians to play on "Country" songs. All the songs which were written by hit country songwriter, Jeffrey Steele. The session musicians included Rock and Roll Hall of Famer, bass player, Rudy Sarzo Ozzy Osbourne, Quiet Riot, Blue Oyster Cult),drummer Troy Lucketta (Tesla), guitarist Kenny Olson (Kid Rock, 7 Day Binge), Guitarist Mark Matejka (Lynyrd Skynyrd) and background vocalist Jason Scheff (Chicago). The four day video shoot will be featured in an upcoming documentary called "Rockville", which explores the changing landscape of music in Nashville, a city known as "The Country Music Capital of the World". 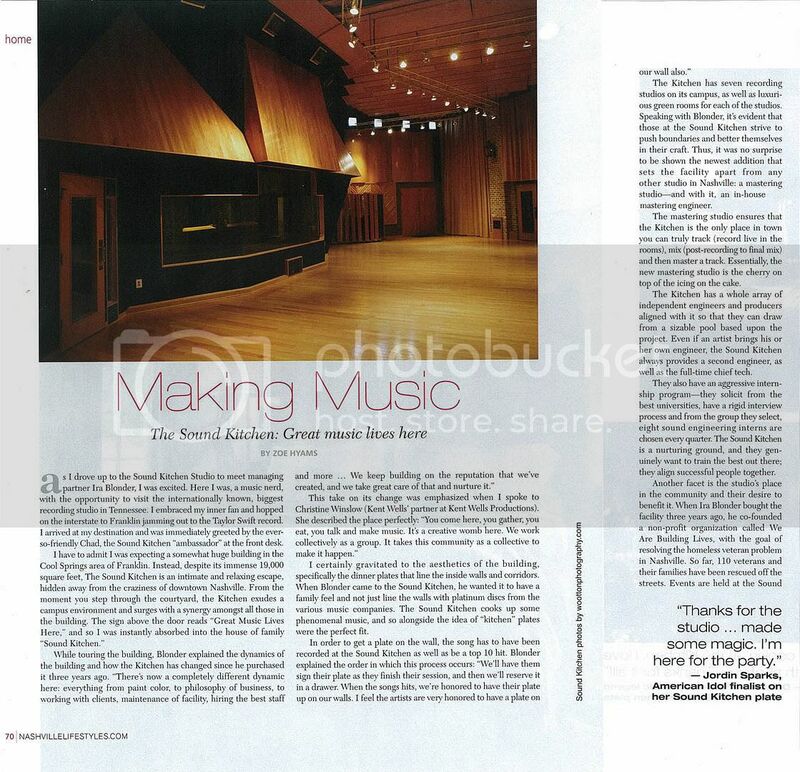 Noted entertainment photographer, Anthony Scarlati,was in the studio documenting the entire session as only he could. All of the sessions and interviews were filmed by Liquid Crystal Productions. Check out the video teaser below. Swamp thing Promo final - Computer from Brian Harstine on Vimeo. 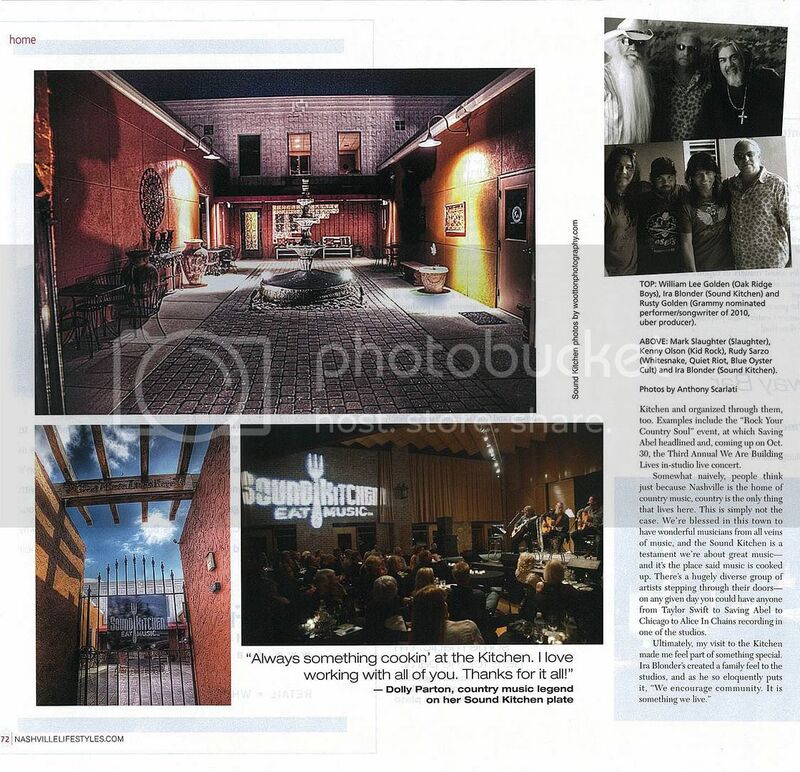 Check out the latest issue of Nashville Lifestyles for a great article about The Sound Kitchen by Zoe Hyams. 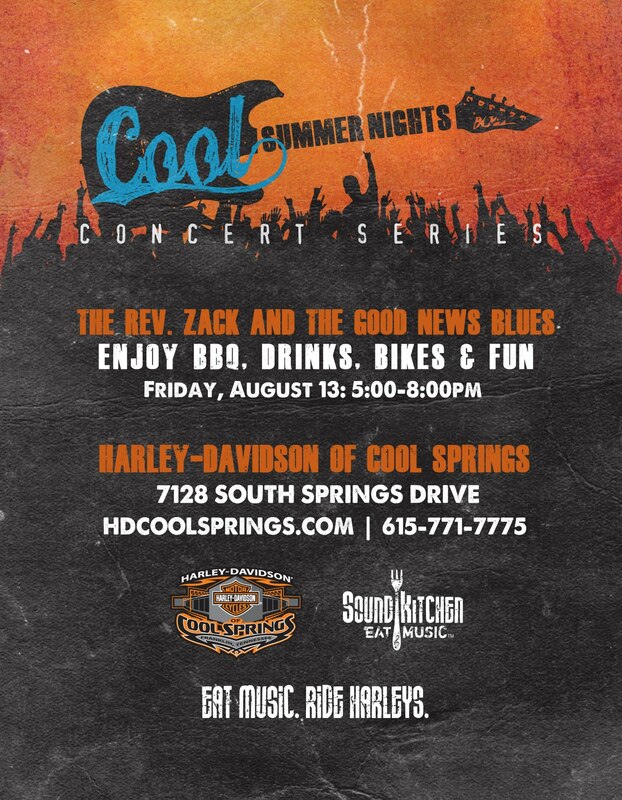 Come join us on August 28th for "Sip'n Savor at the Kitchen" for some great music, food and wine. 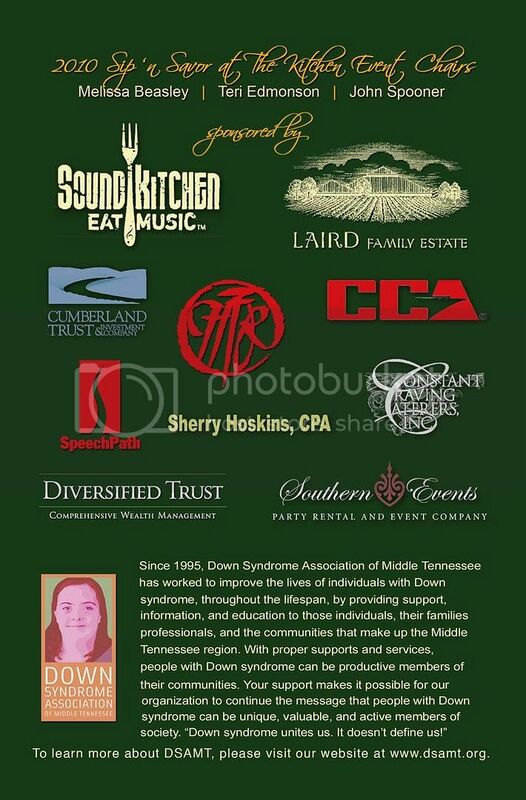 Event sponsors include Laird Family Estate, Constant Craving Caterers, Cumberland Investment & Trust, Southern Events, Diversified Trust, Sherry Hoskins,CPA, SpeechPath and Sound Kitchen Studios. 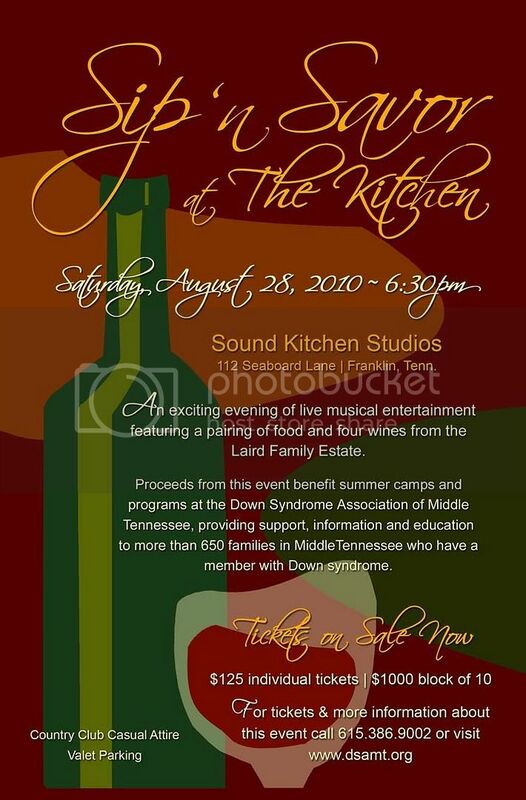 All proceeds benefit the Down Syndrome Association of Middle Tennessee. Take a moment to visit their website at www.dsamt.org to learn more about this event.